My relationship with running is on shaky ground this week. We are just not moving forward as a couple. I mean, we are moving forward, but not moving forward, if you know what I mean. In case you couldn’t tell, I had a bad run this weekend. 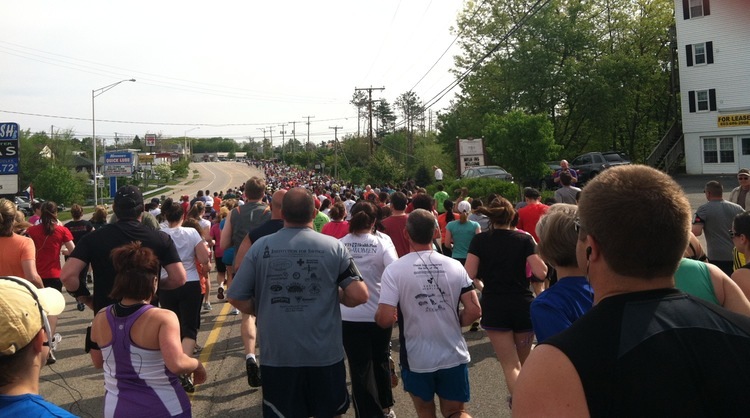 Runners as far as the eye can see at the Margaritas 5K in Exeter, N.H. It wasn’t my worst time. It wasn’t my hilliest race. But I just felt lousy. 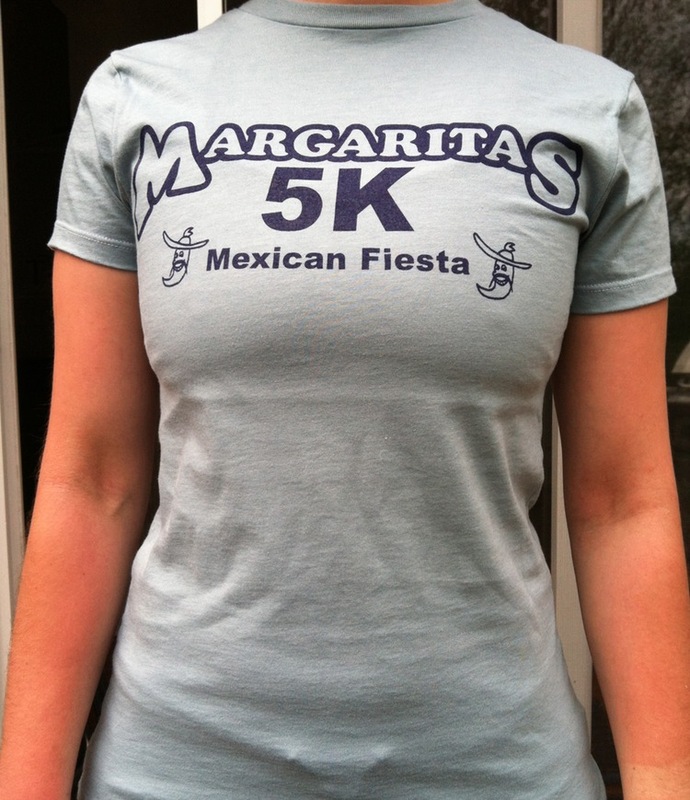 And when a run called Margaritas 5K doesn’t make me happy … well, all hope is lost. My first run with a hard-liquor theme, and look what happens. This was part of the Loco Will Run for Beer series, so naturally the event was fabulous. (Thankfully, it didn’t reflect my lackluster performance.) The only hitch came as we were lining up for our gratis drink at the end and were informed we all needed ID. You could gauge my mood at that point by the fact that I wasn’t willing to schlep back to the car to get it. It takes a lot to make me give up on free booze. The run itself went something like this: run/stop to tie shoelace/run/walk/run/walk/walk/run/curse/run/take inhaler/run/walk/water stop/run/walk/curse/run/walk/give death stare to hubby who came to run me in/walk/run across the finish line/grimace at photographer. It was exceptionally warm though, the warmest run of the season so far. It became clear that transitioning back to hotter weather is going to be tough. I am going to put my lack of skills down to that, and not to the fact that I am heading for a break-up. Because that would be sad. Twenty runs down, 32 to go. It’s a long, exceptionally sweaty road ahead. The aftermath: Chicken burritos from Margaritas. Yum! There may have been other bits and pieces, but we were too focused on the burritos. 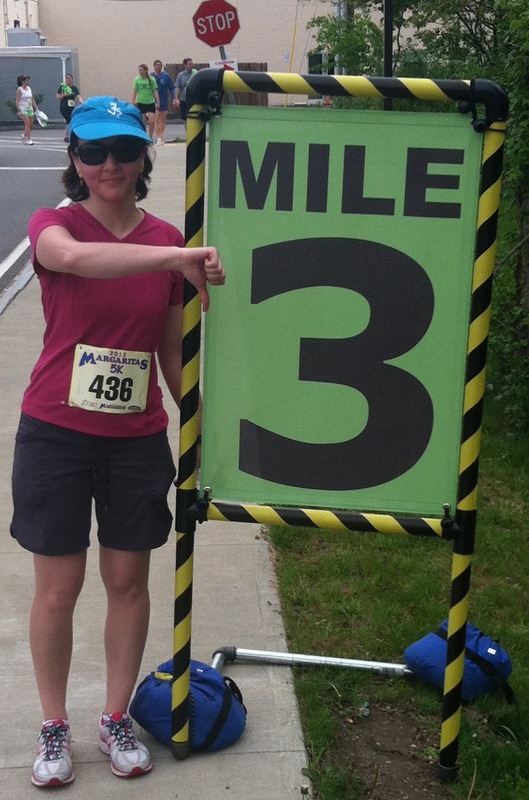 This entry was posted in 52 Weeks, 52 Runs, Fitness, Humor, Running and tagged 5K, New Hampshire, road race. Bookmark the permalink. I am so impressed by your haiku abilities! The Marine Corps Half missed a golden opportunity! The heat definitely makes things more difficult. You just need to condition yourself and you will get there! I love just right temperatures too. They put me in a good mood! I normally run at night after dinner because I’m NOT about to get up early and run before work. That’s for crazy people. On the weekends I notice running in the day light is so much harder than at night! That sun can pack a wollup, even when it’s not very hot. Good luck! You are almost half way there! I completely agree about before-work running. Hubby is trying to get me in on that action, and I am resisting with all my might! I love to sleep far too much to get up at 5am and get sweaty. I am determined to start running at night now that the weather is so nice. We should meet up at Wollaston Beach for a run one night! Sometimes I run there before I pick up Tonto from daycare. I let out an audible groan when I read that you needed ID for the margarita. So sucky. Hope the next race is better! I know, right!! Great event, but how many people really carry ID around with them on a race? 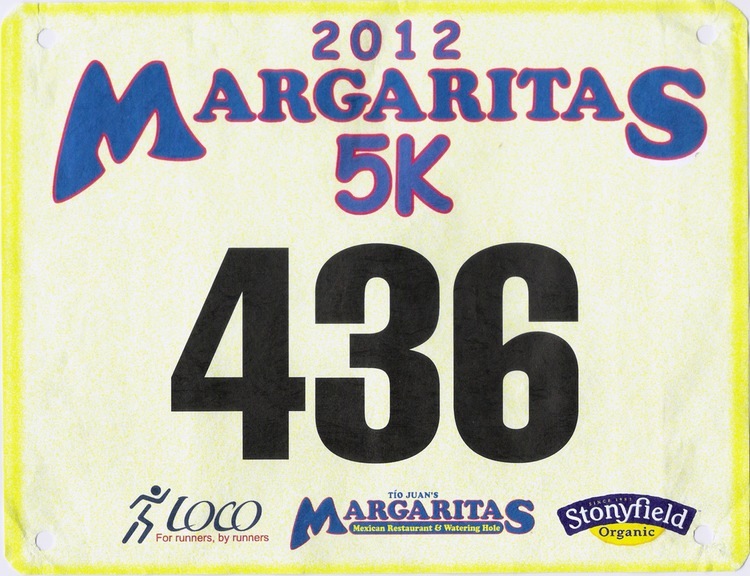 I mean, it’s bad enough that many race bibs have our ages splashed all over them! Congrats! You finished it 🙂 I just did a 10k on the weekend and lots of walking was involved too, but whatever gets you there right? I know that feeling! As soon as it starts getting warmer (and particularly more humid), I suddenly find myself wondering what happened to my endurance? Then I remember this happens every year going into summer and it just takes time to adjust. Keep plugging along and you will get past it. You’ve got a great attitude about it! I’m glad I’m not alone in the transition struggles. I always think I’m the only one with a face as red as the sun, huffing and puffing away. But obviously I’m not! 🙂 Hopefully it will get easier. Otherwise, I’ll have to do a lot of night races! I love your mission to run 52 races this year! Don’t let one crummy run set you back, you still have 32 to go!!! You can do it! I can’t wait for your next race recap. Keep up the great writing. It’s very entertaining and I love reading your posts! Some days it simply doesn’t click – and there’s often no earthly reason why not. A change int he weather can be especially difficult to deal with. Pick yourself up, dust yourself down and get back out on the road – it will be better and you’ll remember why you do it. I’ve had a few bad runs recently, and I blame the warm weather. Yes, I run indoors. Your point? With each post I enjoy your blog more and more. As much as I love summer, the thought of running in the heat does not appeal to me. Good luck with completing your goal. You can do it!! I was thinking earlier this week how much I enjoy getting your weekly posts…..and this week……once again…..brilliant, simply brillant!!! Plus, after reading your posts…..whether good run or bad…..I feel it and know that I am not alone!!! hahahaha Thanks for sharing! I always have some truly sucky runs when it first starts getting warm every year, and I’ve been at this for 10+ years. 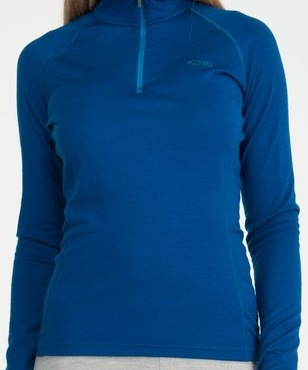 Don’t worry, you’ll get acclimated to the heat! ooooh. i feel you! but think of it this way, if you didn’t poop in your shorts, it wasn’t THAT bad. i had my worst run of 2012 at the Bedford Rotary 12k on saturday…finished dead last. i was cranky and dropping enough f bombs to wipe out an entire town. i can’t stumble out of a warm comfy bed and go out at the asscrack of dawn and run either…..you’re 1000% correct, that is just for crazy people! it’s a new weekend- we both have new races…..i wish you luck with yours. i just looked at your schedule- we have no more together? what’s up with that? i thought for sure i would see you at the last run for beer race (june 3) i have many buds (and teammates) running run to remember this weekend. have fun! i am running lawrence sat & haverhill sunday. heres to a better run! cheers! Hahaha! You crack me up. I’m so sorry you had a sucky run too!! But it’s great that you finished. I have never even run that far! I was supposed to be doing WRFB on June 3 but it turns out that’s a National Guard weekend so hubby won’t be around, and I don’t drive so I have no means of getting there. 😦 But I’m sure I’ll see you at some point! We have a lot of scheduling to do! Hope you enjoy this weekend’s runs! !